#1. My reusable water bottle goes everywhere with me. Most airports have water bottle filling stations, as to many train terminals. Or, I'll ask the restaurant or cafe to fill my bottle for me before I board. I save myself $5 and make sure I stay hydrated along my way! Pro Tip: Make sure you bottle is empty before going through security! #2. I eat lightly when in transit. Most airline or airport foods are microwaved, processed, or just generally not as good as their fresh counterparts. So why waste half a day or a whole day's calories on a hamburger that isn't GREAT? If I'm going to splurge for nachos, I want spicy nachos with fresh melted cheese – not CheezWiz! So I save my calories or SmartPoints for the stuff that's actually worth it, and stick to egg whites, fresh fruits and veggies in transit. Pro Tip: Check the TSA regulations re: where you're flying and bring your own fruit and snacks with you! Much less expensive! 3. I find the delicacy of the City/region I'm traveling to, and make a plan to enjoy it! Pappy's BBQ in St. Louis, chowder in Boston, Mexican food in San Diego – I want to taste what's famed in that city, so I tend to eat a breakfast of egg whites and fruit salad, and choose big greens salads with shrimp or grilled fish for lunch. My snacks are fruits and veggies, so I feel satiated all day AND I get to enjoy that local delicacy for dinner! Pro Tip: TripAdvisor is a great resource for finding GREAT dining experiences! 4. I stock my hotel room with supplies. I pack shelf-stable protein bars, Enlightened broad bean snacks and almonds, and then I stop by a local grocery store or corner market for hard boiled eggs, grapes, bananas, and bottled water. With all those healthy choices, I have no excuse for not sticking with my healthy eating goals. Pro Tip: Most hotels will give you a mini-fridge to use if you tell them you have something that needs to be refrigerated. 5. I find a new way to move my booty! In addition to local delicacies, a lot of cities have fun exercise classes if you do a little research! New York City is home to just about every class imaginable. Stand up paddle boarding is big in Florida, and there are indoor surfing classes (great for your core) in New Orleans. Shred415 is a treadmill and deck workout spot in Chicago. Not up for a class? How about renting a CitiBike or local equivalent? Pro Tip: Nearly every city has a place for you to take spin, rowing or Bootcamp classes. Been intimidated to try these classes at home? Why not try one while you travel so you don't have to worry if someone in the class sees you Zumba to the left when everyone else Zumbas to the right? 6. Take the “No Elevator, No Escalator” Challenge! When I travel, I know I'm sitting for several hours and not getting a lot of steps in. So I challenge myself to extra steps by skipping the elevators, escalators and moving walkways! Pro Tip: On long layovers, I walk 20-25 minute miles each hour, which helps me meet my step goal and keeps me from mindlessly snacking! What about you? 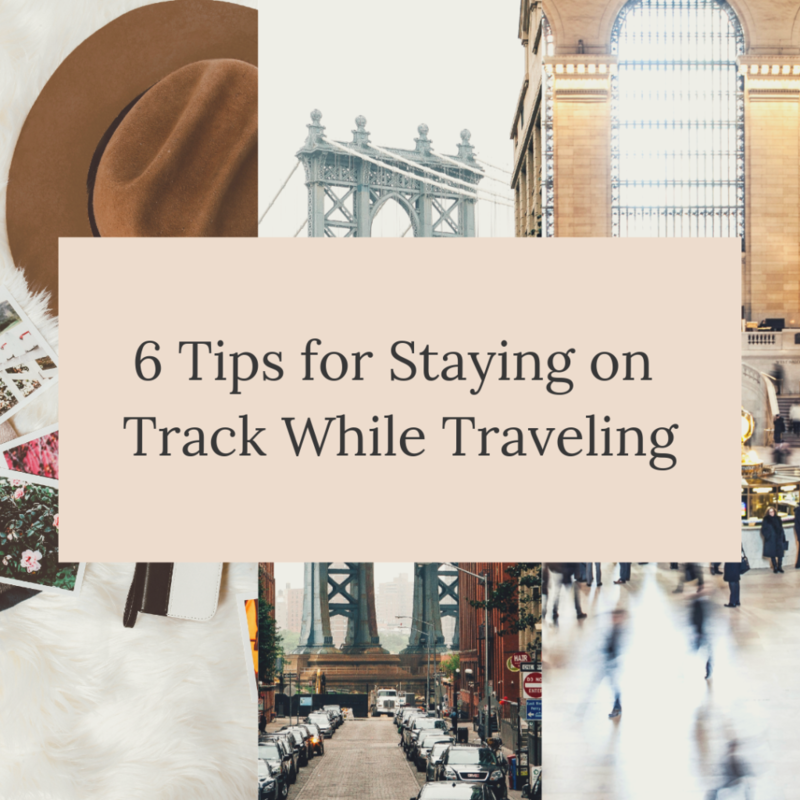 What do you do to stay on track while traveling? This article first appeared on organizeyourselfskinny.com on May 30, 2017.